Elviria is located twelve kilometres east of the city centre of Marbella on the Costa del Sol in Spain. Many villas and apartments are within walking distance of some of the best sandy beaches, restaurants, bars, tapas bars, supermarkets and bakeries. The price comparison search engine below finds the cheapest car hire deals for Elviria. Giving you the lowest and cheapest price for renting a car in Elviria. Elviria is split into two areas, Elviria Playa with a few apartment urbanisations of which Hacienda Playa, Cerrado de Elviria and White Pearl Beach are the best known. 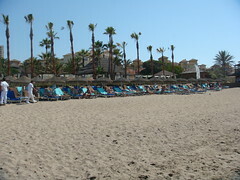 In The Elviria Playa area you will find the five star hotel the Don Carlos and the well known beach club, Nikki Beach. Elviria Hills is home to the 9 hole Cabo Pino golf course, the 18 hole Santa Maria Golf Course and the El Lago restaurant. Luxurious yachts are moored at the picturesque Cabopino harbour. Elviria is considered to be the Malibu of the Costa del Sol. Residents of Elviria are also able to send their children to some top international schools on the Costa del Sol which includes the English International College and the Deutsche Schule Hoffmann. Elviria is the perfect place for families with children to enjoy a summer holiday and be near enough to the glitz and glamour associated with Marbella and Puerto Banus. Elviria has two airports in its vicinity of which Malaga International Airport is the closest. Gibraltar Airport on the southern tip of Spain provides a further gateway for holidaymakers wishing to visit Elviria. Malaga Airport is forty kilometres away with a travel time of thirty minutes while Gibraltar Airport is a fair eighty-eight kilometres away. One of the easiest ways to get to Elviria from the airport is to catch a taxi. From Gibraltar Airport it will cost €104 and from Malaga Airport €56 each way. Elviria has no train station and the best option by train would be to travel as far as Fuengirola and then either catch a bus or a taxi to Elviria. There are no trains from Gibraltar Airport. Getting to Elviria by bus from Malaga Airport also is challenging as the bus service does not stretch as far as the resort but has its terminus in Marbella. 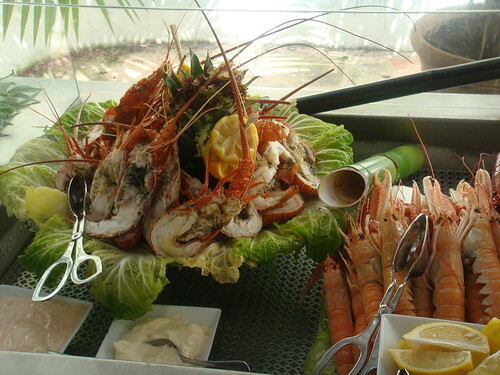 From Marbella you can then catch a taxi to Elviria. The taxi fare from Marbella to Elviria would be approximately€18. Bus services from La Linea de la Concepcion across the border again will take you as far as Marbella and from there again use the taxi service. It seems that are no direct public transport services between Malaga International or Gibraltar Airport and Elviria which only leaves the options of a direct transfer unless you wish to drive yourself. With http://www.tourshuttle.comyou can expect to pay €72 return for a family of four. As most public transport services seem to be challenging there is always the easy way of looking at car hire. Malaga Airport is a large airport so that there are many car rental agencies based in the terminal building to choose from such as Auriga Crown, Autos Lido, Avis, Europcar, Goldcar Rental, Hertz, National Atesa, Record, Sixt and Sol-Mar. Unfortunately there are far fewer car rental options at Gibraltar Airport and you can choose to book your car rental with Niza or Avis Cars. As with anything and everything car rental policies vary from company to company but they do have a lot of the same criteria needed to rent a car in common. Age restrictions: All people have to be the minimum of twenty-one years of age and some rental companies will not accept car rental bookings of applicants under the age of twenty-five. More experienced drivers are also offered cheaper rental quotations so it is wise to always make the oldest person in your party to make the reservation. Many rental companies will allow for a named driver completely free of charge as long as they meet the age restriction and are able to present the correct paperwork at the time of picking up the rental car. What documents does the rental agent need to see? You will need to produce your current valid drivers licence, passport as well as the credit card with which the booking as made. Do I need to show them my current insurance documents? Insurance documents are not a requirement unless you have taken out an annual policy for smaller items. All rental cars are third party insured. Medical expenses are not covered by this insurance policy but would be covered with the travel insurance should you have purchased some. You can also pay an additional small fee to cover yourself while on holiday should you lose your car keys, have a punctured tyre or chip your windscreen. Some of the Spanish roads are not in as good a state as they should be owing to the often unpredictable weather conditions. What happens if my car is stolen while on holiday? Your rental agreement does provide for theft protection. If you do intend to use your car longer than the agreed time, then it is always best to inform the agent otherwise they may report it stolen, which will result in major problems with the local police. If you do return your car later than two hours past the agreed time, then you can expect to pay for an extra day. Is petrol included in the price of the rental car? That varies from company to company and the best policy is to return the car in the same condition in which you rented it. People arriving on late flights should think of renting a car with petrol as the petrol stations close at 22:00 hours to reopen the next day at 06:00. A petrol station is located at the entrance of Malaga International Airport and less than a kilometre away from Gibraltar Airport. Refuelling is an important issue because if you hired one fully tanked up you will need to return it the same way as otherwise the rental agent will do it for you and charge you an admin charge on top. What do I do if I break down? Included in the rental is a free twenty-four hour breakdown service where the problem will be sorted quickly or you will be given a new car to rent. Should you be unlucky enough to receive any traffic fines while on holiday, it is best to take the fine to the nearest town hall and pay it or at least inform the agent on duty of the matter on return of the vehicle. All fines will eventually be traced back to the car rental company who will have no qualms charging the fine to your credit card with a nice administration fee on top. Things to look out for when hiring a car are items such as boot space, petrol and air conditioning. All cars are well serviced, new and should have air conditioning. Luxury models also have a built in GPS and should you wish to rent a car that doesn’t have one you can rent a GPS from €5 a day locally or bring your own. A GPS isn’t normally included in the insurance so do check out the small print as GPS’s are popular items to steal and you would be held responsible. Infant and booster seats can be reserved at the same time as you book the car rental. Do not wait until you arrive, otherwise you may find that you that they have all been rented out and face further expense. Bay seats can be rented from as little as €2 a day. Of course you are always welcome to bring your own. Further optional extras include items such as ski racks and snow chains which you will need should you be considering a visit to the Sierra Nevada. Roof racks and roof boxes can be rented should you have too much luggage to fit into your boot. All car rental companies also offer a policy of unlimited mileage so you can explore and make the most of your holiday without any limitations. Car rental is seasonal and you can expect to pay premium rates during the months of July and August and far less during the off peak months. Examples of car hire in the month of December from Malaga International Airport with a company such as Car Trawler for a week start from as little as £50.22 for a model such as a Toyota Aygo, £102.45 for a Toyota Avensis, £385.15 for a four wheel drive such as Toyota Rav4 and £690.99 for a luxury Mercedes E Class. From Gibraltar Airport during the same period of time with Car Trawler you can rent an economy vehicle such as a Peugeot 107 from as little as £75.34 for a week,£85.35 for a mid range vehicle such as a Renault Megane and £345. 92 for a Toyota Rav4. A people carrier such as a Ford Galaxy 7 seater costs £432.06. Although it does seem to make sense to hire a car at the airport because of the current public transport limitations you can rent a car locally in Elviria from Sivi Rent a Car. Because there are so few direct transfer options, families with children are especially encouraged to rent a car for their holiday to Elvira.